If you follow a training plan, you will usually want to know one thing before a training run: At what speed do you want to run? The question of the right tempo is very important primarily for intervals and endurance runs, but also for easy runs or long runs. There are many different philosophies, both concerning the names of the areas and their respective values. We used to show the athlete the fixed specifications from Daniels’ running formula, but in German-speaking countries the GA1/GA2 ranges should be much more common. With the latest change in RUNALYZE you not only get the training areas back to Daniels, but you also have the possibility to choose between different training philosophies or make your own settings. The whole thing is displayed as a panel “Training Paces” on the right side. By default, the panel should appear below the “Calculations”. If this is not the case so far, the section under Configuration -> Plugins can be activated. 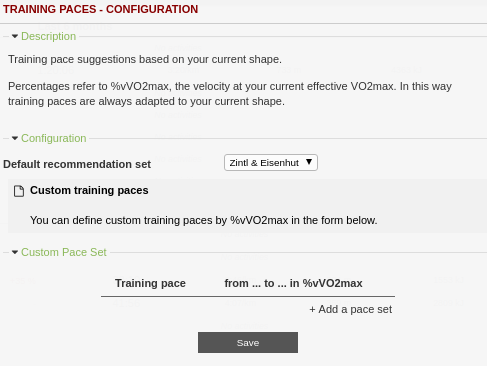 The training pace suggestions are based on your current form. The percentages refer to %vVO2max, the speed at your current effective VO2max (so 100% is about 12 minutes of competition pace). In this way, the paces are always adapted to your current shape. 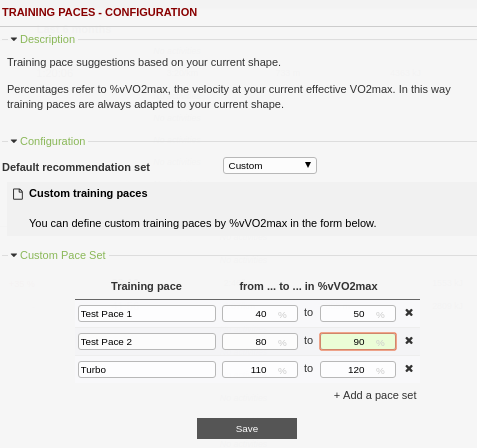 When defining individual training ranges, these must also be defined in %vVO2max. Specifications, which in the philosophies mentioned are actually made in %HFmax, were converted by us to %vVO2max. Just hit the Save button and will see your custom paces in the panel. This is a really Neat Feature!! !